Sports are a worldwide hobby. You can find leagues for most sports in almost every developed country and many undeveloped countries around the world. It is basically impossible to keep track of all of them, though, even with today’s outstanding technology. Still, most people who enjoy sports also enjoy more than one sport. Thus, we consider a sports app a different genre than an app that covers just baseball or football (both footballs). A good sports app should show you all kinds of stuff from all kinds of sports. So, with that in mind, here are the best sports apps for Android! We have individual sports apps lists littered throughout the article if you want to see more! 10 best European football apps and soccer apps for Android! ESPN has one of the most comprehensive sports platforms in all of media. Some people don't like them and that's okay, but one cannot deny the breadth of features and coverage they have. That includes sports scores from a variety of leagues, a streaming service (ESPN+) with sports coverage from multiple leagues, a competent fantasy sports platform, and at least a semi-decent selection of written news, rumors, op-eds, and other content like that. Of course, ESPN is mostly for North American sports fans. The streaming service costs $4.99 per month and includes a lot of niche sports along with some popular ones. The app with all of the scores and news is free. Feedly is an RSS reader app. Those aren't as popular as they used to be. It lets you follow whatever blogs, sites, and news sources you want. That works great for sports fans. It lets you follow various sites without downloading their app and bloating up your phone. Additionally, you can get those indie sports news sources that usually don't have apps. It lets you follow the sources and sports that you want without any additional fluff. The app is also free with no in-app purchases or ads. The sites you visit still have ads, though. Reddit is an above average site for sports fans. There are a variety of subreddits for a variety of sports topics. That includes individual sports, individual teams, individual leagues, and sometimes individual players (looking at you, Messi). This gives fans the chance to interact with other fans across the globe about their favorite sports, teams, and sports topics. It's not a great spot for stuff like live updates or scores. However, the communities are usually active enough to make this a decent news source as well as a place of discussion. Reddit Gold costs $3.99 per month and adds a few extra features, but they're not necessary. SofaScore is arguably the best sports scores app out there. It has scores for basically everything. That includes football (both types), baseball, basketball, and hockey along with random stuff like darts, badminton, bandy, tennis, volleyball, rugby, cycling, and even Motosport. The UI is clean and the organization is surprisingly good for how many sports scores this app covers. It's a must for basically anybody that enjoys sports from all over the place. Seriously, this app is that good. TuneIn Radio is probably the best radio app for sports fans. It features a bunch of radio stations from all around the world and that includes talk radio and sports radio. There are over 100,000 stations and podcasts on the site. Additionally, the app supports live games for MLB, NBA, NFL, and NHL. However, that is a premium feature. This is an excellent app for people who still like the old charms of listening to the game on the radio. The free version comes with most of the stations. There is a $9.99 per month subscription for stuff like curated live games. Twitter is a terrible place full of hateful people. However, sports are one of the few bright spots on the social network. Most leagues have their own Twitter profile as do most teams and most players along with bloggers, TV personalities, and other sports pundits. This lets you follow along with basically everything that's happening. Some players prefer Instagram over Twitter for their personal stuff. Those who like to follow players may want to try Instagram as well. In any case, teams and leagues often post scores, highlights, updates, news, and some fun banter among themselves. The times are changing and Twitter is probably a faster place to get some of this stuff than many sports news apps. Yahoo Sports is a large platform with a lot of features. The news side of things is its bread and butter. They cover most sports around the world and they have blogs that cover some sports more in-depth or from different angles. Additionally, they stream the occasional live game and that included 2019's Super Bowl. Finally, their fantasy sports platform is arguably the best in its genre with a competent fantasy sports app. It's not a terrible ecosystem to be a part of. All of the apps are free. Yahoo Fantasy Sports allows for the occasional paid league if you want. YouTube is an excellent catch-all for sports fans. You know that if you miss something it'll be on YouTube within the hour. Plus, there are a variety of excellent highlight channels that put together some seriously epic highlight reel supercuts. It's not a great place for news, scores, or streaming live sports. However, it's an excellent spot to relive old classics, catch up on highlights, and lose yourself for 20 minutes while you watch every unassisted triple play ever recorded on TV. The premium version removes ads, allows for background play, and gives you access to YouTube Music. Most sports leagues have their own apps. This is especially true for North American sports and at least most European football leagues. 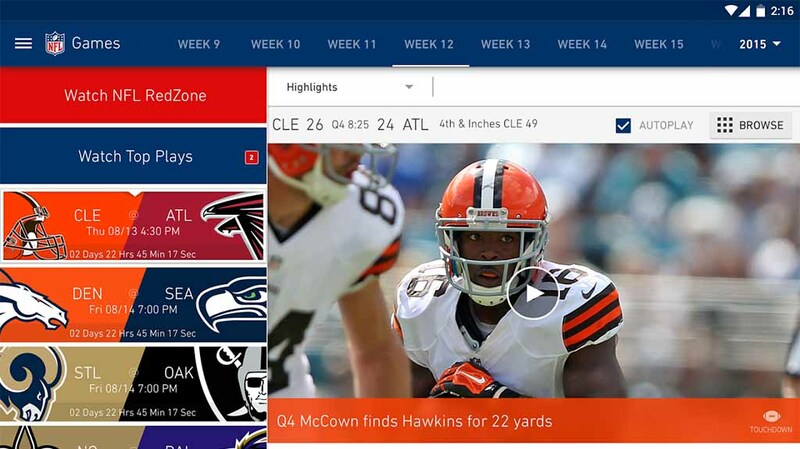 These apps give you schedules, sport scores, updates, news, and some even stream live games. The subscription costs vary from sport to sport. However, the core mechanic is basically the same. You get access to every out of market game. These are excellent apps for sports fans. The non-streaming portions of all of these apps are free. Live TV isn't just a cable thing anymore. Live TV apps are available now with all kinds of channels and that includes sports channels. You can get your local sports channels for your home team games, some national sports networks like NBC Sports, and some premium sports channels like ESPN. We can't recommend a specific one because they all offer those things and we don't know what else you need. However, we do have a list of the best live TV apps linked at the button above and the video below. Good luck! If we missed any great sports apps for Android, tell us about them in the comments below! You can also click here to check out our latest Android app and game lists!